Make water features running rather than standing, or treat them with mosquito dunks. Install ceiling fans on porches – flies and mosquitoes do not like moving air. MASK SOUNDS WITH RUNNING WATER. If noise is an issue that prevents you from indulging in a peaceful outdoor experience, try using a water feature to drown out the distraction. Water is a great way to gently camouflage sounds from close neighbors. Try installing a small fountain near your seating area for a more tranquil atmosphere. If the water feature doesn’t appeal to you, soft music playing in the background can be just as effective at masking sounds. With wireless speakers, you don’t even need an outlet to play your music. Even when you are craving the warmth of the sun, sitting outside without any shade on a hot, sunny day will send you running for the AC before too long. There are a lot of options for adding shade to your yard. Try freestanding umbrellas, a cloth overhang, lattices, a shade tree or a pergola. HAVE ADEQUATE NIGHTTIME LIGHTING. 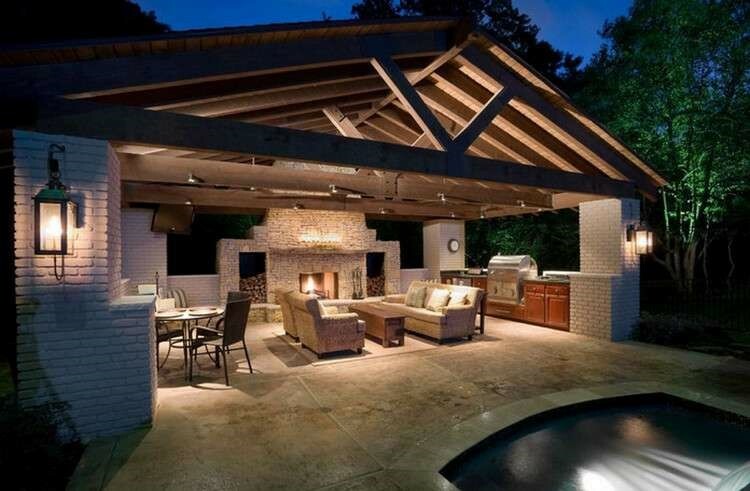 Your outdoor space will really come alive at night with the right lighting. Try placing lighting under a bench seat for subtle illumination, make a ring of lanterns on the grass around your dining table or hang strings of lights overhead. Landscape lighting will add to the ambiance as well.